Whenever I take some time away from sewing, no matter how much fun I'm having, I realize just how much I've missed it. So, when our house was quiet for the first time in a long while, I headed straight for my sewing machine. (It also got my mind off the goodbyes, at least a little.) I decided to start with the Lazy Days skirt. It's a short, satisfying sew just right for my first day back. I had read about the awesomeness of shot cotton around the sewing blogosphere but I didn't exactly get the hype. Online, it looked to me like an ordinary solid. But, oh it is not! It's nearly impossible to see just how beautiful shot cotton is from the screen. In your hands, wow, it's amazing. It looks as though it has so much texture, similar to a linen perhaps, and there are various subtle shades of color that make up the solid. Yet (best of all?) it's surprisingly lightweight and incredibly soft. Imagine a favorite, oft-worn button down. This pattern is written to fit across a pretty wide age range. Given Indigo is 6, instead of creating the skirt from one panel of fabric cut selvage to selvage (like I did when she was 2), I cut two panels, selvage to selvage. This gave the skirt a lot of fullness. I wondered whether it would be too full for the elastic but it wasn't. 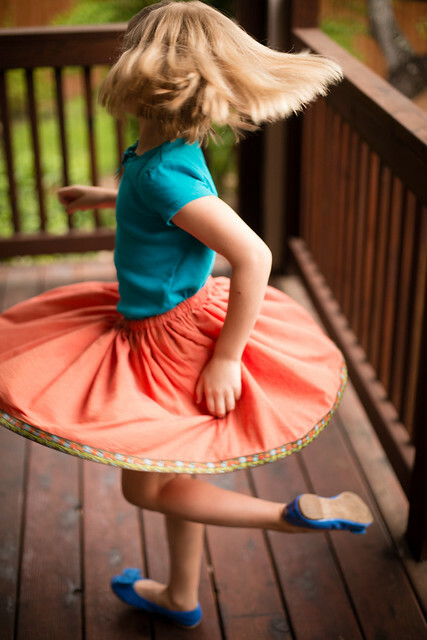 It twirls like a circle skirt which only makes it more appealing to my girl who loves to dance and twirl. Another great experience with the Lazy Days skirt! 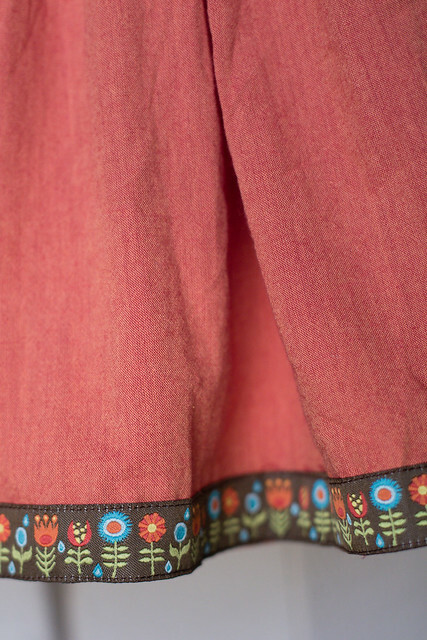 Agree with your description of shot cotton - it's a pretty perfect garment material, especially for kids...it does wrinkle quite a bit, but I bet the ribbon hem helps with that. 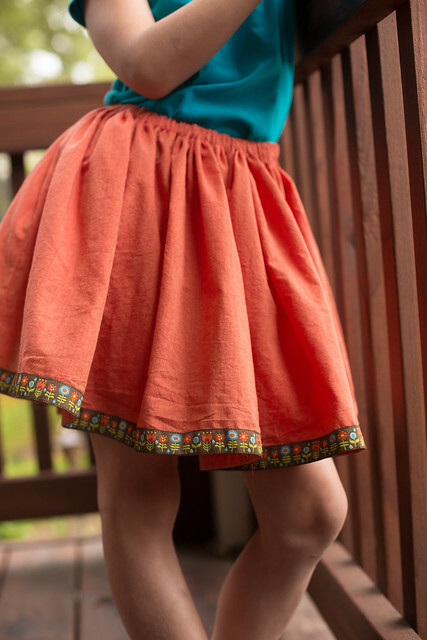 Love this skirt and glad you're back to sewing! i hope your vacation to NYC was fabulous! you won't regret it. it really is amazing stuff! 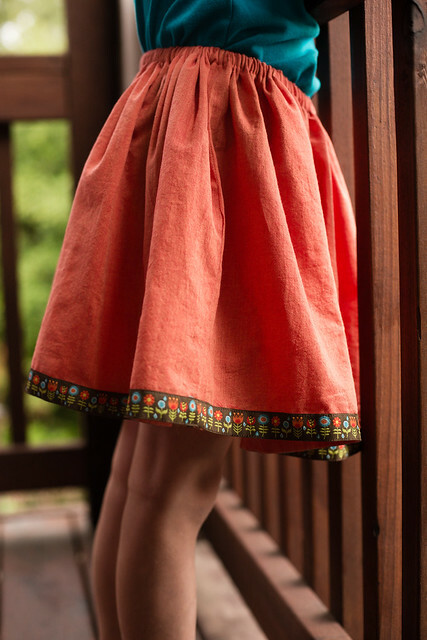 Beautiful skirt, I wondered about the "fullness'. 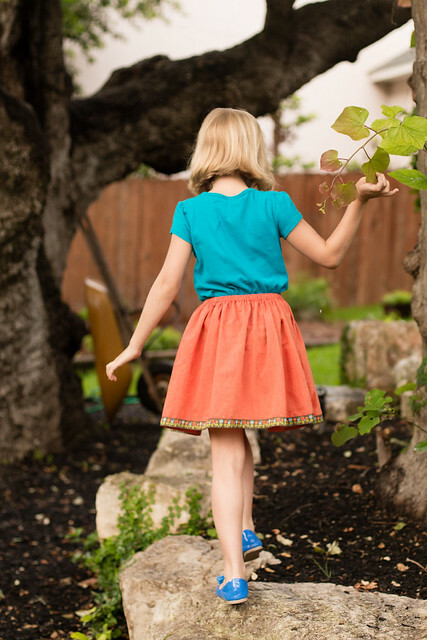 Clever you to get so much twirl in one little lazy days skirt! Totally agree about the shot. LOVE. IT!!! gorgeous! shot cotton is just so dreamy. and i love the fullness! regarding evie's hair - that was all dan! he's a hair rockstar. it looks like a heart in the back! he's quite creative!